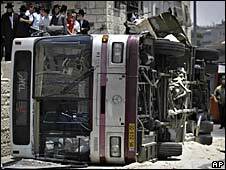 The BBC has said it was wrong for its News at 10 programme to show the killing of a man who drove a bulldozer into a bus and several cars in Israel. There were 120 complaints after footage of the man being shot by a police officer was screened on Wednesday. The images failed to strike "the right editorial balance", the BBC said in a statement on its complaints website. Hussam Dwayat was shot after a rampage in Jerusalem in which he killed three people and wounded dozens of others. BBC correspondent Tim Franks described how the attacker had rammed a bulldozer against a bus again and again until it flipped on to its side, and had also crushed or damaged other vehicles. News at 10 showed footage of the bulldozer being driven away along Jaffa Road in the city centre. There was a struggle in the vehicle's cab and a man was seen opening fire, before a body was removed. On other BBC bulletins - and the BBC News Channel - the footage was stopped immediately before the shooting, and the moment of death was not screened. On Thursday, Craig Oliver, who edits BBC One's nightly bulletins at 1800 and 2200, wrote on the BBC editors' blog that it was a "disturbing" scene. But he believed it was "important and illuminating very occasionally to see the reality of violence" on the News at 10. Showing the footage on the News at Six would have been "too disturbing", he added, "because, pre-watershed, children would be watching". The BBC's complaints website acknowledged it was "not normally the BBC's policy to show the moment of death on screen". "These are always extremely difficult decisions to make," its statement read. "However, on reflection, we felt that the pictures featured on Wednesday's News at 10 did not strike the right editorial balance between the demands of accuracy and the potential impact on the programme's audience."